Idea, an Aditya Birla Group Company, is a pan- India integrated wireless operator offering 2G, 3G and 4G services, with National Long Distance (NLD), International Long Distance (ILD) and Internet Service Provider (ISP) operations. Idea is one of the top three mobile operators in India, with an annual revenue in excess of USD5 billion and a revenue market share of 19%. 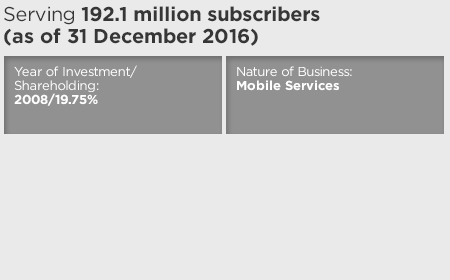 With nearly 200 million subscribers, Idea ranks sixth in global rankings of operators in terms of subscribers for a single country operation. In line with the Government’s vision of Digital India, Idea has accelerated its efforts in building a digital economy. Idea has embarked into digital services, having begun its transformation from a pure play mobile operator to an integrated digital services and solutions provider, and expanded its digital offerings to digital communications, digital payments, Cloud and storage, digital information and more. Idea’s pan-India mobile voice network covers over one billion Indians across 400,000 towns and villages. As at end December 2016, Idea’s network comprised 230,000 sites and over 128,000 km of optical fibre. Idea provides world-class service delivery through the most extensive network of customer touch points, comprising of 8,780 exclusive Idea outlets, call centre, digital app and social media. Idea’s commitment to providing superior customer experience led to the company achieving No. 1 ranking in market research firm Forrester’s ‘Customer Service Index 2016’. Idea has consistently retained its leadership position in Mobile Number Portability (MNP), continuing to grow its MNP net gain to 20 million subscribers.